Departures of Eurowings: Terminal T1, floor P1, 340-342. Flight arrivals of Eurowings: Terminal T1, floor P0. terminal T1 P0, baggage reclaim hall �2. Eurowings has the OACI code: EWG and the IATA code: EW. Eurowings is the subsidiary of Germanwings to operate short and medium haul flights. It is starting from October 2015. Eurowings flies direct from Madrid to Viena and link to a huge destination network of cities in Europe: London-Heathrow, Manchester, Hamburg, Paris, Colonia-Bonn, Stuttgart, Munich, Stockholm, Oslo, Milan, Zurich. 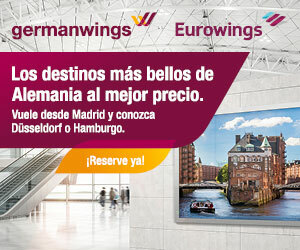 Check here Eurowings last promotions.